A low-tech, low maintenance approach to nano planted tanks. From time to time, folks ask questions about setting up so-called nano tanks, which for simplicity’s sake are defined here as tanks less than a foot long/tall/wide. I find myself surprised though that hobbyists can cram almost as much equipment and accessories into these tiny cubes as in larger systems. 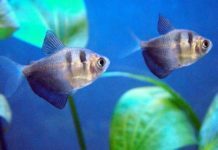 Thus, I would like to offer a little of my own experience in setting up and maintaining a mini tank, with the hope that others are persuaded to try out a much simpler (and cheaper) alternative to piling in the gadgetry. 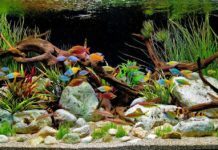 The conventional wisdom of the planted aquarium hobby is “bigger is better”, as larger aquariums provide a broader template for designing aquascapers and more margin for error in water chemistry regulation. 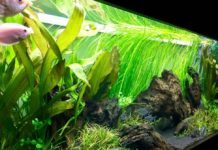 But the appeal of a little green haven on one’s desktop is hard to resist and the efforts of many Japanese aquascapers can leave one’s hands itching to replicate such successes. The famous Takashi Amano’s Nature Aquarium series provides a sampling of possibilities that a rigorously maintained miniature aquarium can offer. For those who are disinclined or unable to spend a fortune or provide near 24/7 worth of upkeep on maintaining this square foot of space, an alternative approach is possible that should in no way be seen as inferior. This is of course provided that one is willing to pursue a little thought, research and planning, and invest a wee bit of patience into this endeavour. There are, I am sure, several other “low-tech” methods for enjoying nano tanks, but I will just share my own experience and observations here. The tank size for this design will be 12 x 8 x 8 inch all glass outfit. You can cut out a black air conditioner insulation sponge which serves as a base support for the tank (certainly better than ugly white styrofoam). You could set up this tank on your living room. This works even in rooms where there’s not much natural light. We want to keep maintenance work to the bare minimum, so we’ll eschew rooted plants altogether, using just a centimeter worth of plain gravel as a substrate. 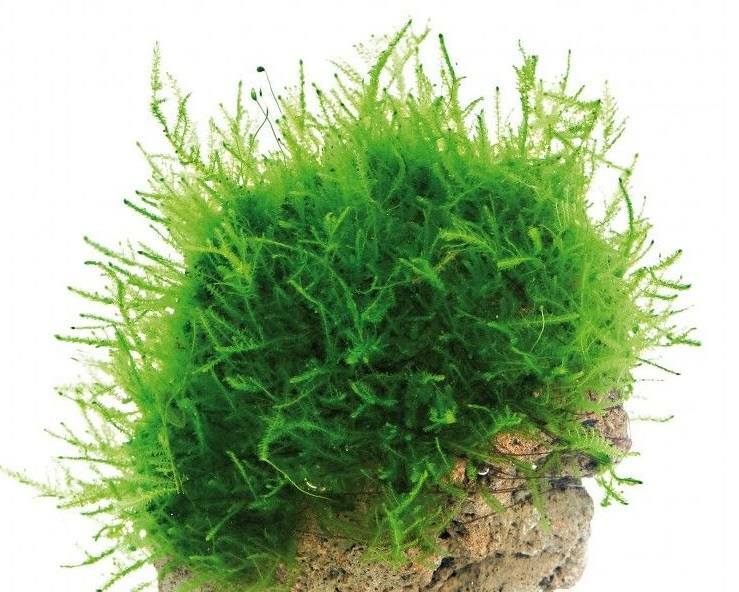 For the lower and front portions of the tank we can use Java moss, Christmas moss and Monosolenium tenerum (aka Pellia), while small pieces of driftwood with attached Java fern (normal and Windelov), mosses and Anubias barteri can be placed towards the back. 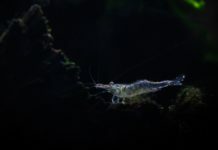 If you do this right, the growth will be thick and intertwined, and it could serve as a good nursery for shrimps in the tank. I am sure other permutations are possible. One guess of mine is that if some direct sunlight is provided for a few hours daily, a good number of stem plant species could be grown even without CO2 injection. With adequate lighting, many plants could be allowed to grow emersed as well. Aquatic and non-aquatic plants (e.g. money plant, Spathyphyllum) could be combined too, with the latter positioned with submerged roots. Another scenario is laying down a fertile substrate for growing cryptocorynes, which do well with less light and CO2 than most plants. With slightly more light, a small lush field of Echinodorus tenellus, dwarf sagittaria or Marsilea sp. is a plausible goal. 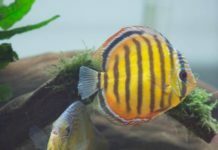 Which Fish to Use in Our Nano Tank? 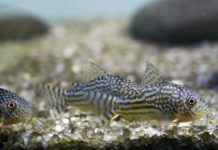 In my tank, the livestock consisted of three 2 inch long kuhlii loaches, one half-grown guppy, nine Boraras maculates and an unknown number of shrimp (Malayan, Cherry, Bumblebee and Taiwan). If shrimps are not to be the main focus, my personal view is that any fish larger than a neon tetra (that includes neons and cardinals) looks oversized for a 1 ft tank. 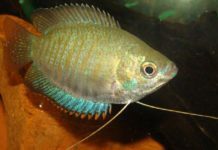 Neither should a pair or more of territorial species such as dwarf cichlids be considered. Off the cuff suggestions for suitable livestock include pygmy croaking gouramis (Trichopsis pumilus), white cloud mountain minnows, cyprinids in the Boraras and Microrasbora genera, Rasbora dorsiocellata, Badis badis, bumblebee gobies, small corydoras species, the smaller tetras and barbs, blue-eyes, medakas, small killies and bettas (note that the latter two groups are prone to jumping). 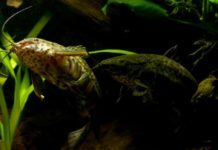 A couple of otocinclus cats should be enough to take care of diatom growth. Aesthetically, no more than two (one is better) primary species (excluding algae eaters and benthics) should be chosen, or the result is likely to look hodgepodge, with no sense of unity. The only accessories we need to use are a clip-on light fixture containing a 9W compact fluorescent tube and an automatic timer switch. Lighting hours are 11 daily. The greedy inhabitants are fed daily with an alternation of flakes, frozen daphnia, algae wafers and freeze-dried cyclops (however, in my tank, I once have left them unfed for over a week during overseas trips with no problem). I change about a third of the water fortnightly, using a little plastic cup to scoop out and pour in water fresh from the tap, with a couple of drops of a fertiliser supplementation. There are no algae problems (which is hardly a surprise given the shrimp population), other than an occasional excess of diatoms on the front glass (which is easily scrubbed off). On the whole, this is probably as low maintenance as a planted tank could be. The only problem I encounter is an occasional (twice last year) hazard whereby an adverse reaction following a partial water change is observed. 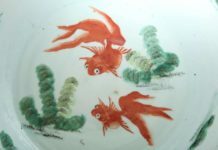 I would find that within an hour, the water turns cloudy and the shrimp gather at the water surface in a weak condition. 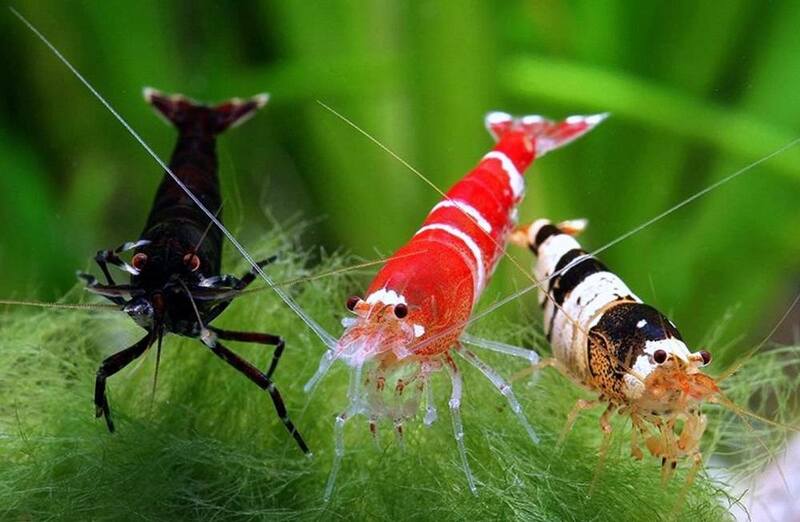 Sensitive specimens like Malayan shrimp can succumb almost immediately. Changing the water again using fresh tap water does not help, while using water stored overnight in a pail or recycled from other tanks alleviates the condition. Thus, the cause is probably heightened levels of chlorine or other chemicals to which invertebrates and tank microflora are particularly sensitive. I do not use anti-chlorine solutions, so nowadays I give myself 3-4 hours of observation time after a water change to ascertain if any ill-effects result. As a matter of fact, I sometimes wonder if I could get away without partial water changes altogether (or maybe monthly), since periods of prolonged neglect appear to do the tank no harm. At the least, I hope this brief article prompts some to attempt their own “low-tech” mini setups and share the results. I do find that the task of planning and designing a tank concept (and the weighing of various options) can be highly stimulating in itself, and given the relative ease of starting a mini tank, your hobby can easily expand into interesting new avenues. For those with children at the age of curiosity, a mini tank, under careful supervision for both the welfare of livestock and child, could also be a rewarding start to a livelong passion.